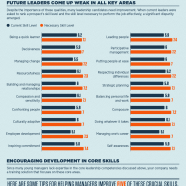 Candidates for the upper management fall short in key leadership competencies. Some training directions are given to smoothen the disparity with the established skill standards. Finally great leaders are more than talented managers.